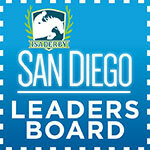 IsaDerby San Diego Leaders Board! We’re half way to the finish line for IsaDerby San Diego! Check this week’s Leaders Board here to see how your team is progressing at the end of Week 7! This recognition period is from Monday 16 February to Sunday 5 April 2015. Check out the IsaDerby San Diego Flyer for more information on the race, important dates and frequently asked questions!